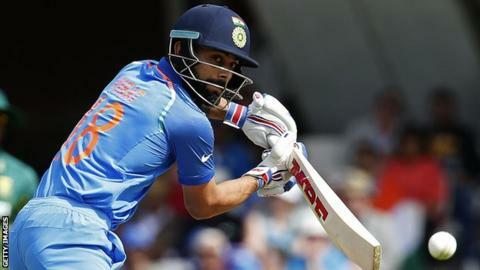 Captain Virat Kohli says India are wary of Bangladesh's threat in Thursday's Champions Trophy semi-final at Edgbaston. Defending champions India topped Group B following wins over South Africa and Pakistan, who beat England on Wednesday to reach the final. India also thrashed Bangladesh by 240 runs in a warm-up game last month. "A lot of teams have surprised the opposition and we're not taking anything for granted," said Kohli. "There are no guarantees in this sport. We're not going to go according to past results and what we've done in the past tournaments. "We will use whatever momentum we've gained in this tournament to execute what we want to. "Going into a big game like this, we're going to treat it as how we treated the last game. Our mindset does not differ." Bangladesh, who finished runners-up to England in Group A thanks to an impressive five-wicket win over New Zealand, are appearing in their first semi-final in a global competition. In 2015 they recorded their first ODI series win against India. "Bangladesh have taken huge strides," said Kohli. "They are a very dangerous side on their day and everyone realises that. "They have cricketers who are skilled, who are committed to play for Bangladesh and play with a lot of passion." India opening batsman Rohit Sharma was limping during India's final practice, but Kohli hinted that they would name the same team that beat South Africa on Sunday, with spinner Ravichandran Ashwin keeping his place ahead of pace bowler Umesh Yadav. If selected, 35-year-old all-rounder Yuvraj Singh will make his 300th ODI appearance. "His contribution to cricket has been outstanding," said Kohli. "He's been a total match-winner for India, won so many big tournaments in big cities, and this is just a testimony to the kind of talent he possesses." Bangladesh were beaten by India in the 2015 World Cup quarter-finals, and were eliminated from last year's World Twenty20 when, with two runs required from three balls, they lost three wickets. "Obviously we have been disappointed, especially in the T20 World Cup when we couldn't go through," said Bangladesh skipper Mashrafe Mortaza, who was captain for both matches. "It happens sometimes in cricket, but we forget it. "We can't just think what happened in the last two matches [because] coming into the ground it will put some more pressure on to us. "We're playing the first time in our life in a semi-final, so that is a fact, but India have got more pressure than us because the huge population is there and people love cricket in India a lot."